It may not seem like the right time of year for a craft pertaining to sharks, but my parents just took my son to Adventure Aquarium in Camden, NJ. They are having a special promotion that if you style your hair like a shark fin, or wear something shark-like, your admission is $10.00. This promotion only runs until the end of October 2008. There is a link to the aquarium in case you would like to call first--you never know if things are subject to change. So, of course, having mainly boys, doing hair is not my specialty. So for weeks I fretted about getting my son's hair to stand in a fin shape for his trip. Then my mom said to me the night before the trip--I wish I could make something, but I don't know how to attach it to my head. In kicks the creativeness. Mom's picking up son at 8:30. 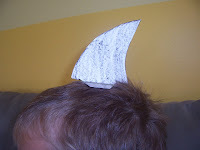 We wake at 8:00 and in that time, I get my son dressed, have him eat breakfast, brush his teeth, and make three shark fins for them all to wear to the aquarium. This includes going through the recycling bin looking for cardboard signs from my daughters' new bedding. Yes, it is that easy and hear is the kicker--my parents said that three families asked where they could buy one of them, even before they reached the entrance. If I would have known they would have been so popular I would have made tons more:). So I thought I would share them with you in case you might be making the trip, or if you are doing an ocean unit these will be fun for the kids. On the card board you draw a shape like the one at the right. It's a fin with a tab at the bottom. 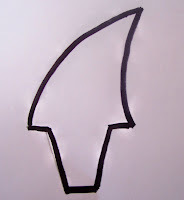 I drew one fin and then cut out two by putting two pieces of cardboard together. 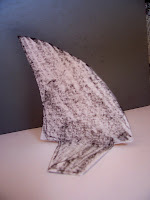 Then I glued the two fins together(make sure you don't glue the tabs together). colored both sides black, and bent the tabs upward. Then I placed it on top of my son's head--oh yeah, you need to have some hair on the head--and bobby pinned the tabs to his hair. All done. 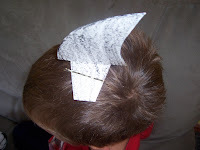 My son was really hesitant about having to have fin shaped hair, but he loved his shark fin so much, he wore it the whole time at the aquarium.